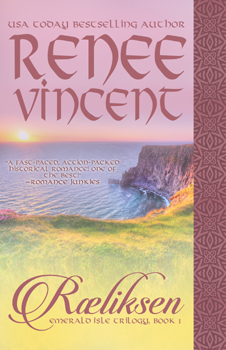 Winner of two categories by Love Romances Cafe: "Best Book Cover 2010" and "Best Historical 2010"
"This is my first read by Renee Vincent and she has undoubtedly earned a place on my auto-buy author’s list. This story has all the makings to being a wonderful screenplay for what I can only imagine being an absolutely gorgeous movie. This book and author earn my highest recommendations and I feel privileged to have read one of the best. It is a must read for any lover of historical romance or even lovers of romance in general." "Ræliksen was unlike any other historical romance book I have read. I couldn't put it down. 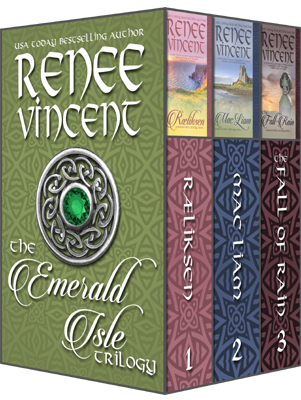 Renee Vincent has the gift to make a book come alive and for everything you read to seem like it is happening before your eyes." 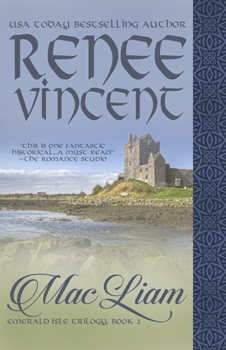 "Ræliksen, the first book in author Renee Vincent’s Emerald Isle Trilogy, is a fast-paced, action-packed historical romance, which Ms. Vincent brings to life right before your eyes. Enriched with vivid descriptions, well-drawn complex characters, an exhilarating plot, humor, plot twists, danger and sizzling romance, this story is realistic, historically accurate and unforgettable; a story you will remember long after the last page is read. I enjoyed this story and look forward to reading the sequel, Mac Liam, which comes out in December. I highly recommend Ræliksen to anyone looking for a terrific read." "If you are a fellow romance junkie, then picking up this book is a no-brainer. 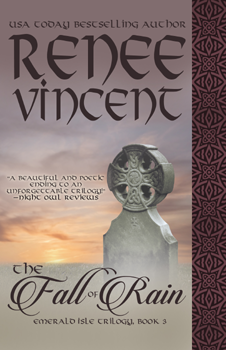 Vincent's descriptive writing style brings the tenth century and it's characters to life. Be prepared for an emotional roller coaster ride, as within the pages you will live and breathe their way of life--their journeys, struggles, joys, heartaches and most of all the deep love and devotion of Mara and Daegan to one another, as well as those they hold dear. Rich in history and packed with action and timeless romance, this is a MUST read for any lover of romance, historical or otherwise." "The author has done an excellent job of bringing the past back to life with her vivid characters. I do not know much about this era, but the historical detail is very impressive. The story itself is very involving, with vivid characters and an exciting plot. Her written descriptions are particularly well done and the reader will have no problem picturing settings and characters." "What a beautifully written book. This book is full of so much love and sacrifice. I loved everything about this book. Not once did this book lack with excitement, I couldn’t turn the pages fast enough. I was enthralled with this book and loved learning about Deagan’s life. I loved how Renee captured every detail of Ireland and what it would like live in Ireland back in those days. This is such a magical book that will capture your heart and your attention. A must read for everyone. Fantastic job Renee, I look forward to reading Book two in this wonderful series." "What a beautifully written book. This book is full of so much love and sacrifice. I loved everything about this book. Not once did this book lack with excitement, I couldn't turn the pages fast enough. I was enthralled with this book and loved learning about Deagan's life. I loved how Renee captured every detail of Ireland and what it would like live in Ireland back in those days. This is such a magical book that will capture your heart and your attention. A must read for everyone. Fantastic job Renee, I look forward to reading Book two in this wonderful series." "Let’s just make a note that this reader LOVED this book. Every single one of the twists, turns, and Oh. My. Goodness. Moments." "RÆLIKSEN is a love story that’s shaped not only by the land and the sky, but by the poignancy of a rich and brutal history. Renee Vincent doesn’t exploit this history, nor does she make light of it. It simply is what it is, and the facets are so intricately a part of the story that they exist as one. And therein lies the masterpiece. Every word of this story has meaning. Every moment leads to the next. Every word is simultaneously natural and brilliant, each one holding an unmistakable place in history with the telling of this tale."